The Espagnolette lock with rotating bars is especially designed for those cabinets that require securing at the top, middle and bottom. It is a pin tumbler cylinder that is small, stylish and perfect for cabinets that use seals to protect sensitive items inside. Here you can see a diagram of the rotating bars and how they work. 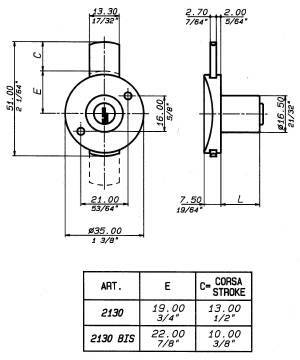 The technical measurements are pictured above. As the authorised distributor in the USA, we will soon make these Serrature Meroni products available. 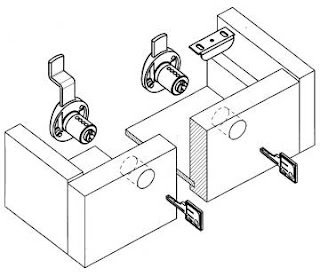 Pictured above is the Serrature Meroni 2130 Screw-On Cabinet/Drawer Lock. This is a pin tumbler lock made to the exceptional standards demanded by many leading international cabinet makers and furniture designers. The second picture above, displays some technical drawings showing some applications the 2130 can be used for. 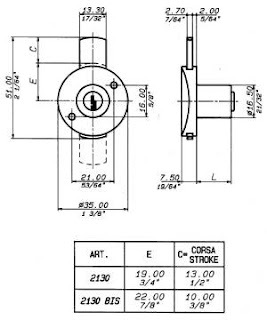 The third drawing above, shows the technical dimensions of the 2130 lock. This product is available in brown, black and white (inside body). Each lock comes with 2 keys. 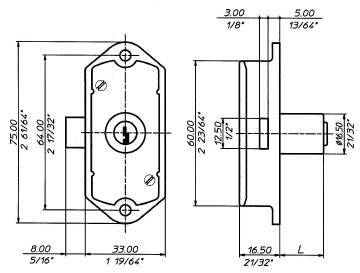 In April this year we posted about Lockwood Australia's new 7444 Cavity (pocket) sliding door lock and have received numerous inquiries about it. 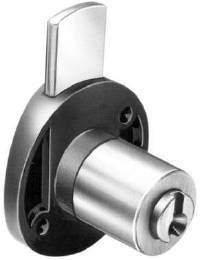 Competitively priced, this product makes securing pocket/cavity sliding doors much easier. The design of this style of lock is not made for replacement of the common square/rectangular pocket door catch, most common in the USA. 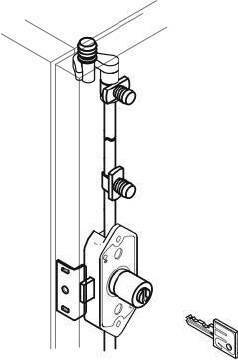 The Cowdroy P697 Double Cylinder Pocket Door Lock is designed for that very purpose, to enable easy replacement of your existing pocket/cavity sliding door catch. We just received our first samples of this new product and are putting it through our testing regimen. The product comes in it's own blister pack that can be displayed easily on a hook. You will be required to cut the packaging to take the product apart, prior to installation. It uses a 5 pin tumbler LW4 keyway, which is identical to the popular KW1 (Kwikset) key profile, prolific in the North American market. 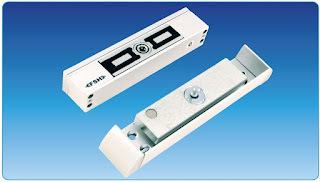 This means that the lock can be keyed alike with other similar branded keyway profiles. With a little modification, we can provide restricted key cylinders for use in a master keyed system. 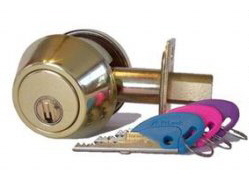 The product cannot be keyed to Schlage or Yale keys at this time. We are working out the final pricing details now and expect to sell this product for about $110.00 plus shipping. 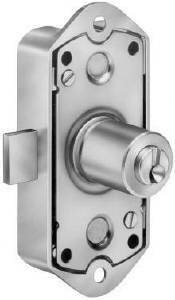 Schlage are widely considered one of the leading lock manufacturers in America today. They try to be at the forefront of design and perhaps they have achieved this with the introduction of their newest product The Schlage Keyed Entry Lock With Built-In Alarm. 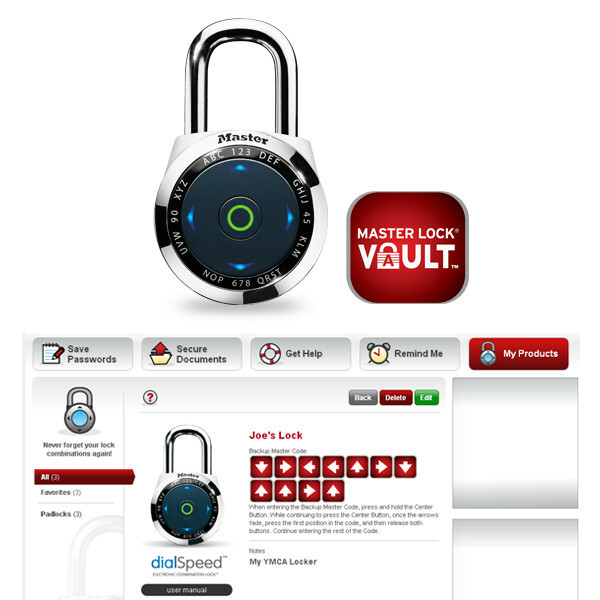 Expect to see this product soon at major retailers and select locksmith companies across America. 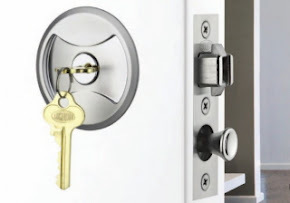 FSH are an Australian company at the forefront of design for electric locks, strikes and unique security locking devices. Trevor Mackle is a principal and leading engineer/designer with FSH and was awarded with the People's Choice Award from the ABC television program "The New Inventors", a couple of years ago. A rather interesting video on their website shows the actual segment that explains how this product differs from mainstream electro magnetic locking devices. The MEM is actually smaller than other brands but packs significantly better mechanical locking attributes and equal to superior holding force. Compact enough to fit in a variety of applications, the product is light years ahead in technology and design. It is very user friendly and surpasses many international standards. Master Lock Co. have just released their newest creation and now introduce a significant and modern interpretation of the humble combination padlock. The product features an electronic digital interface that provides speed, ease and multiple personal codes per unit. The padlock comes a resettable primary code and 3 additional guest/user codes. Each padlock comes with CR2032 cell batteries included that will last about 5 years with moderate use. The batteries are easily replaced. 2-1/16" (51mm) wide metal body, each padlock can be operated one-handed, is built with Boron Alloy steel shackle that provides extra resistance to sawing or cutting. For INDOOR USE ONLY - Do not allow padlock to get wet. 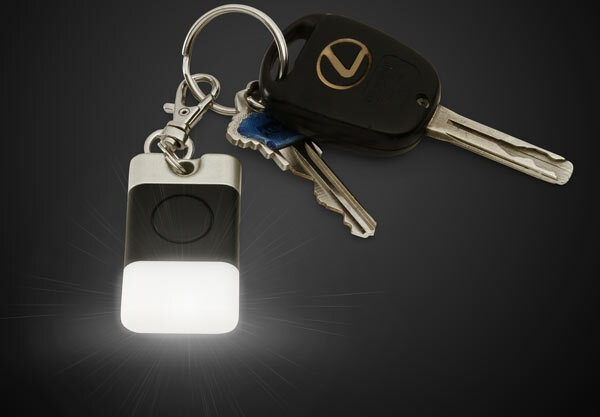 Our friends over at ThinkGeek have recently released this terrific unique product that is a Low Glo Key Fob. Designed to enable one to have that torchlight always handy, this "always-on" low glow flashlight is designed with a non replaceable (need) LED that operates on a cell battery similar to the ones found in watches. The "always-on" technology is a sensational idea because it is low glow, meaning it consumes very little power. When needed, simply press the button and the light will brighten for a period of time. The keyring attachment means you can clip it to your keys or your tent zipper (for campers) or just anything else you fancy that extra little bit of light for. They say the battery is designed to last for 1 year and is easily replaceable. Boat enthusiasts are rejoicing thanks to this unique invention that secures virtually any accessory to your pleasurecraft. The multitude of uses for this sensational product is limited only by your imagination. The product is made from marine grade materials that secures almost any accessory to your boat or work bench. The intelligence of this product conveniently does away with the need for separate mounting assemblies for all your products. Simply attach your accessory's mount to the steel plate and then lock the plate into the V-Lock™ bracket. As seen in the video, there are virtually unlimited uses for this product. Securing your items has never been so easy. 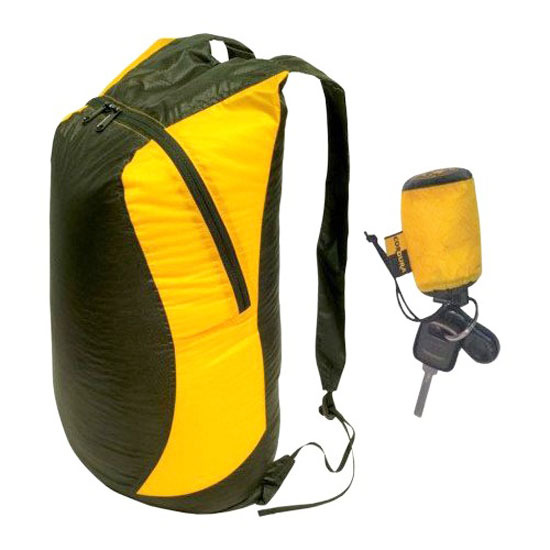 The Ultra-Sil® Daypack is a new product from Sea To Summit Outdoor, Travel and Backpacking Gear that actually compresses to the size of a keyring attachment allowing you to have that extra bag handy when required. A novel and unique aid for travelers or anyone in need of an extra portable storage solution. Theft recovery microchips are a modernized version of the ages old microchip technology we have been using for many years in identifying pets or animals. 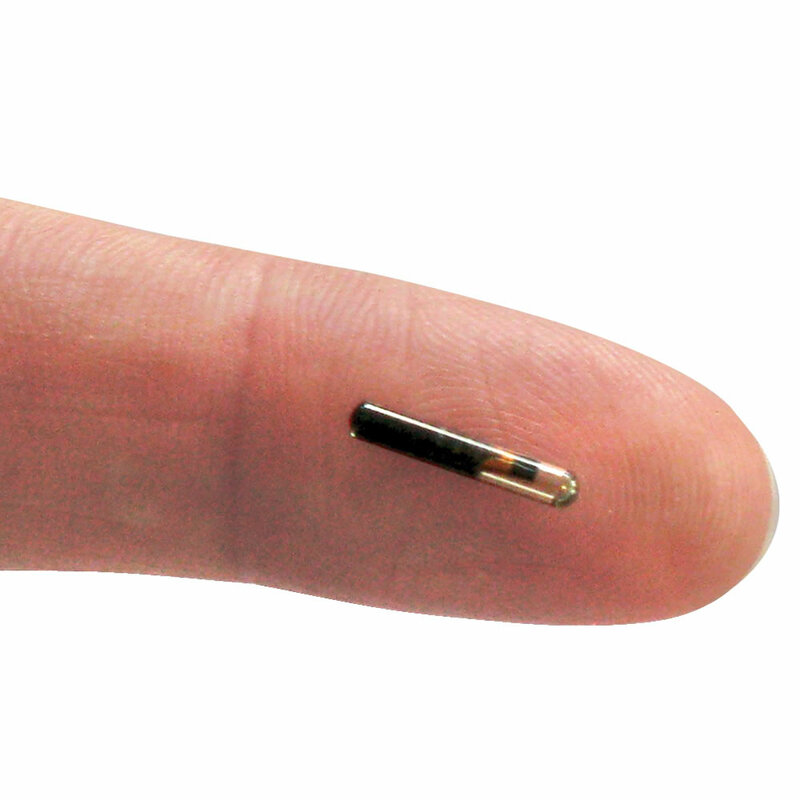 Similar in purpose to those types of devices, this tiny chip can be programmed with the owners information and contact details and then embedded in any tangible inanimate product. If that property or product should happen to be stolen, it would be possible to identify it easily and it's owner by scanning the device for the existence of the microchip. This is certainly another useful device to aid authorities in finding the correct owner of a stolen item, no? Sometimes, securing your room or office is a very personal task. In the movies of the last century, many films used props that included secret passageways and secret doorways that were hidden by false walls or Hidden Bookshelves. 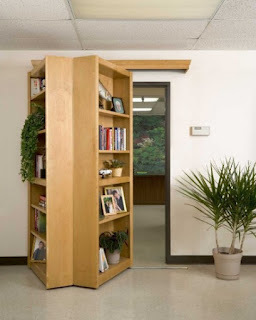 Now an enterprising manufacturer has made the Hidden Bookshelf concept available at a competitive price. This product is made from your choice of Oak Wood, Maple Wood or Cherry Wood and uses a high strength rail and pelmet system to make the function and use easy to manipulate. How private would you like to make your room (mancave)? Misplacing your keys is definitely not a fun activity. It is one of those things that happens to a great many of us. I am a locksmith, but I am constantly placing my keys somewhere and forgetting where i put them. Or they fall between the cushions on the couch (when I fall asleep, there) and when I want to leave in a hurry it is painful to have to spend an extra 15 minutes (or more) searching for them. There are multiple offerings that enable you to locate your keys, but the Hone For iPhone 4S as shown in the above video is a new idea that simply works with the planets leading smartphone. Home invasions across the USA are increasing supposedly due to the poor economy and the ease at which perpetrators are learning to ply their trade, thanks in part to the enormous amount of information spreading across the internet. There are a few companies here that are producing unique quality products aimed at preventing home invasions and identifying criminals. StranDNA is one such company that produce a modern itteration of the ages old door chain. Strikemaster II is produced by A Safe Homes International, designed to repair a broken door frame casing while at the same time preventing future door kick ins. 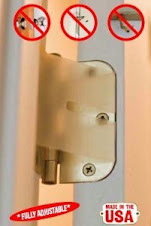 OnGard Door Brace is produced by an Atlanta based company designed to prevent door entry. Bilock is an internationally acclaimed guaranteed 100% bump proof and virtually pick proof key system with keys that cannot be copied. Many of the above products cannot be purchased at the big box stores, only from approved industry professional locksmith companies. For further information on any of the above listed products, please contact us at your convenience. StranDNA are a United Kingdom based company that have re-invented the humble door chain, found across the world for the past couple of centuries. This intelligent device provides two distinct differences from the humble door chain of yesteryear. A) A 110db piercing alarm at the point of entry. The law enforcement agencies across the world have been using modern forensic technologies for the last few decades to identify perpetrators of crimes. But speedy results have been difficult to achieve until recent developments in DNA sequencing. The Society Of Professional Locksmiths is the USA based approved instructor of especially trained and permitted StranDNA products. 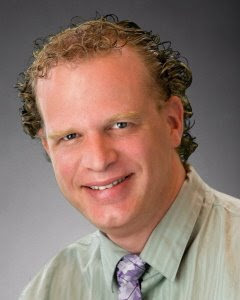 Criminal defense attorneys in the USA will have an unsurmountable burden of proof to dissuade a court of their clients involvement in a crime, when the DNA product clearly provides investigators with conclusive proof of their involvement, dramatically reducing lengthy investigations and reducing the costs for local law enforcement agencies to provide incontrovertible evidence of involvement. Soon to be released in the USA, only approved installers trained by the Society Of Professional Locksmiths will be able to help residents and tenants and also local law enforcement departments effectively reduce crimes.